I began my college search very early into my junior year of high school. I had always believed that I would and could go to a four year university. Guidance counselors and other people I knew who had been to college suggested attending a community college for a couple of years before transferring to a four year university to finish my degree. I had always shrugged off the idea, thinking that I would go with what most high school students would; go straight into a four year college. While talking with my guidance counselor of three years, she told me to seriously look into a community college for two years. Again, I shrugged off the idea. I began asking around. At work, several of my coworkers had attended community college for two years and then transferred. One coworker told me that she was glad she did hers that way. I never began seriously considering community college until I began looking at college costs. I was currently stuck between three different schools. I wanted to attend Elon University, because I had done an internship there this past summer, the campus was beautiful, and I knew they had the degree I wanted to go for. I also wanted to attend North Carolina State University; my dad had graduated from NC State and I have always wanted to go to State. This was when I added a third school to my list, Alamance Community College. Several of my classmates have taken classes there, and several of my coworkers have gone or are going here. The chart shows the average cost for one year at the three colleges I was debating between. 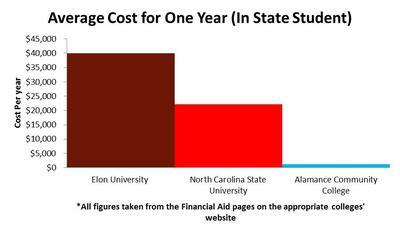 As you can see, Elon, the private university, has the highest cost. NC State is towards the middle of this range. However, at the end, Alamance Community College has the lowest cost per year. I knew this was an important decision to make as a high school senior. After much consideration, I decided that I would take two years of classes at Alamance Community College to hopefully take most, if not all, of my general education classes, and then transfer to NC State to finish the degree I wish to have (bachelor’s in computer science). In making this decision, I had to take into account several factors. If I attended a four year university to begin with, I would not be able to live at home, and, unlike most teenagers today, I like home! By attending Alamance Community College, I would be able to live at home for a while before venturing out on my own. In addition, I work a part time job at a restaurant as a waitress and hostess. If I attended a four year university, I would have to leave my job and would have no source of income. I would soon become the stereotypical broke college student! By living at home and attending Alamance Community College, I can work for two more years before leaving home, saving up every penny of it. The main reason I chose to attend Alamance Community College is because it was cheaper. General education, if the credits are transferable, can be taken at any college across North Carolina. I took it into perspective when I was posed with this question, “Why do classes for $20,000 plus when you can take them for $2000 at home?” This made me realize that Alamance Community College would be the way to go for me. I was very skeptical about attending a community college at first. I hear all of my friends and classmates talking about how they’re going to go to a big university for four years. Me, on the other hand, am going to stay close to home for a bit, knowing that the path I chose was the right one for me. Read more Community College, State University, or Private University choices from other students and parents who have been through process. Thank you Ashley for sharing your story Community College, State University, or Private University? You Decide . Community college is very cost effective, especially if there is a good school near your home that offers many classes that will transfer. The fact that you already have a job is a plus too, as sometimes it is hard to find a new one at a 4-year university as many students are competing for those student jobs. Many of your friends who attend a 4-year university right away will be in debt with student loans. A few will be lucky to have scholarships and grants that pay a majority of the cost, but most will not. Community college allows you to save money and of course students should always submit a FAFSA or Free Application for Federal Student Aid to apply for financial aid for college, including scholarships, grants, work-study and federal loans. Most people think about going to a four year university when they are in high school, not realizing that that might not be the best choice. In my opinion, it isn't even a smart choice. Going to a community college for two years then going to a university is the most logical choice. Community college is cheater and gives you the opportunity to find yourself before spending a ton of money because you decided to switch your major 3 times. It also is a lot more cost efficient too. I was home schooled for 3 years and my family didn't know about how to pick colleges. The one thing I did know was that I wanted to do something that dealt with art and that I needed to go to a two year before I went to a bigger school. I am so thankful that I chose this path. Since then I have changed my major twice and it didn't cost me a penny. Most semesters I get money back because my financial aid covers tuition. Depending on the college that you go to, you could get a thousand dollars or more back after fees. What better way to save up for a car, pay off some bills, pay for college related activities, and take on extra courses to finish early. Even the cost of living is cheaper. Dorms could be fully paid for or if you live with parents, just pocket the money for later use. Think of all the possibilities. If you get a job while in school as well you could save that money, save the grant money, and get scholarships on the side. You could even get your full grant amount back! In less than a year, you could pay back any loans you may have from previous schools, pay for a car, and save up money for your stay at a four year. All of this done without the stress of extremely hard university classes. Community college not only allows you to save money, you can join clubs and organizations. Most or all are free at two years, while at universities you probably have to pay a small or big fee. Some of these clubs and programs have wonderful activities like studying abroad. Bigger institutions have this program but at a two year college it will cost less and will be much shorter. Since it's a lot cheaper it will be easier to find a scholarship towards it. You could even use that money saved from grants and work to pay for it! If you decide you want to go to a university first, I urge you to go to a small one first. When you are young, you need to get use to college and all of your choices. Most of the time you won't even know what you want to do. You could always transfer to a four year and have two years of the degree already out of the way. By then, you will know what you want and a lot of the choices you might have. Read more stories about the big decision of Community College, State University, or Private University from other students and parents who have been through process. Thank you Sache' for sharing your advice about the benefits of a community college. I think this is a great way to go for many students, and you’ve certainly summarized many of the benefits. I would add that there are some excellent teachers at community colleges too. Best of luck to you.